Year 6 students Opal, Taimana, Jaxon, Ryan and Tiana with Water Corporation marketing and |customer education manager Anjelika Fawcett. A GIRRAWHEEN school has been recognised for its water-saving efforts. Roseworth Primary School enrolled in Water Corporation’s Waterwise Schools Program 10 years ago and since then teachers have been educating students on the need to value, protect and conserve water resources. Customer and community general manager Catherine Ferrari thanked the school for its contribution. “In our drying climate, it’s important the next generation are aware of how precious water is and Roseworth Primary School has been sharing this message for 10 years,” she said. Deputy principal Sue Brockman said students learnt about waterwise behaviours. 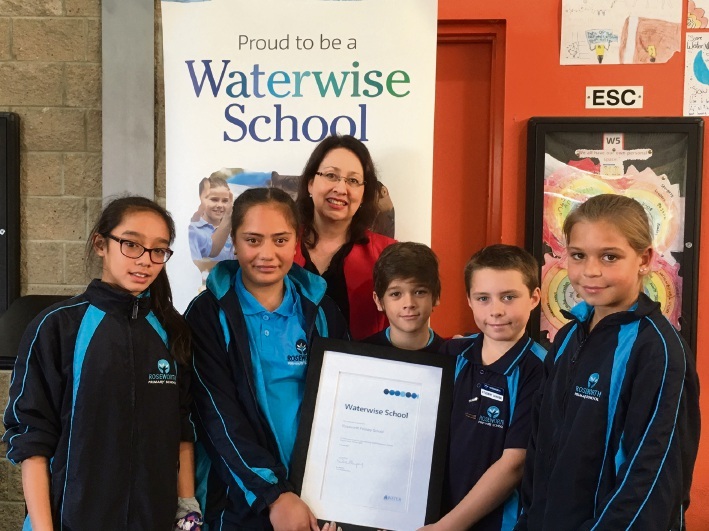 “The Waterwise Schools Program has helped to educate our students about water so that they have the knowledge and skills to make sound water management decisions in the future,” she said.